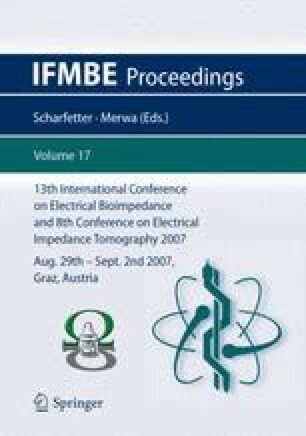 A quantitative objective method to evaluate levels of intracellular and extracellular environments hydration in periodontal tissues by means of the bioimpedance spectrometry was developed. Moreover, the degree of the periodontal tissue functional disturbances in dental diseases and treatment efficacy was studied. Group of healthy volunteers (n=47) and of patients with various dental diseases at different stages of treatment (n=237) were studied. Periodontal tissue impedance was measured using the device "ABC-01" (“Medass”, Russia) at frequencies 5, 20, 50, 100, 200 and 500 kHz. The values of fractional variations of impedance according to step-by-step frequency changes were used as indices for differential assessment of the extra- and intracellular spaces hydration levels. Normal range of said hydration indices was estimated according to measurements of healthy volunteers. Patients with different dental diseases showed various combinations of hydration indices deviations from this normal range. Inflammatory diseases were followed by the significant edema in the extra- and intracellular spaces. Evaluation of the treatment efficacy revealed the more effective restriction of the extracellular edema.